Delivering Good (formerly known as K.I.D.S/Fashion Delivers), the charity of choice for new product donations made by companies in the fashion, home and children’s industries, held its annual gala fundraiser last on Wednesday, November 7, 2018. This year’s gala, “Our Children, Our Future”, raised an impressive $1.8 million dollars. Celebrity guest and presenter Shaquille O’Neal even jumped up on stage and volunteered as a fast-talking bid auctioneer. The honorees for this year’s annual gala were recognized for their support and dedication to Delivering Good: Haim Dabah, Founder, KIDBOX and Managing Partner, HDS Capital; Gabriel Hamani, CEO, BHI; Annette Repasch, Group Vice President, Meijer, Inc.; Jamie Salter, Founder, Chairman & CEO, Authentic Brands Group; and Nick Woodhouse, President & CEO, Authentic Brands Group. Mr. O’Neal had the pleasure of introducing the award to the Authentic Brands Group who have been a long time product donor to Delivering Good. 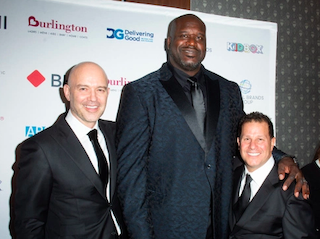 “I was honored to introduce Jamie Salter and Nick Woodhouse from Authentic Brands Group at the Delivering Good Annual Gala tonight,” shared Shaquille O’Neal. 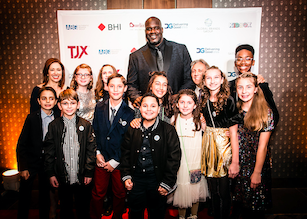 “Their commitment to giving back to their community and working with charities like Delivering Good to support children and families fighting poverty is extremely admirable.” Additional presenters were Bravo’s Carson Kressley and TLC’s Pnina Tornai. In addition to the outpouring of emotion for the evening, Allan Ellinger, Chairman of Delivering Good and Senior Managing Partner of MMG, announced Andrea Weiss, Founder & CEO of The O Alliance, as his successor for Chair of Delivering Good. Ellinger will be stepping down from his current role, but will still remain active with the organization. The honorees’ commitment to Delivering Good has impacted millions of children, families and individuals in need, both nationally and internationally; millions of people are helped each year. Since the inception of Delivering Good in 1985, over $1.8 billion of donated products have been distributed through its network of community partners, serving the poor and disadvantaged worldwide. “It is an honor to see how the support from our generous product donors helps Delivering Good make a profound impact in the lives of people challenged by poverty and natural disaster,” stated President and CEO of Delivering Good Lisa Gurwitch. This year’s gala continued to highlight children and their families. The need for new product to help families and individuals affected by disaster is great, and one out of every six Americans face poverty. Throughout the year, Delivering Good’s product donors help provide hope, dignity and self-esteem to people in need. At the gala, guests enjoyed a 5-course meal at the newly renovated Ziegfeld Ballroom. The evening commenced with a performance by Ripe The Band. Delivering Good, Inc. (formerly K.I.D.S./Fashion Delivers) is a 501(c)(3) nonprofit, and the charity of choice for new product donations made by hundreds of companies in the fashion, home and children’s industries. Donating new merchandise provides these companies with a simple and effective way to help millions of kids, adults and families facing poverty and disaster each year. Since 1985, over $1.8 billion of donated product has been distributed through our network of community partners. Learn more at www.Delivering-Good.org.